Despite talks of trade war and erratic tweets and policies by US president Donald Trump, China’s rich still see in the US the preferred destination for migration, says the 2018 Hurun report on immigration and China’s HNWI’d. And despite talk of the Brexit, London is moving upwards in its annual rankings, says Hurun chief researcher Rupert Hoogewerf. The UK climbed from third place to second with a score of 8.5. Despite the UK being set to leave the EU, London remains one of the world’s leading financial centers, and British education is regarded as second only to that of the United States. Investment immigration to the UK comes with the benefits of one’s children enjoying an elite British education, and of the family gaining access to its high quality medical and welfare systems. Furthermore, a favourable exchange rate makes investment in the UK more attractive. Rupert Hoogewerf said, “Brexit has had little impact on Chinese entrepreneurs. At present, British property represents good value, with uncertainty over Brexit and the weakness of the pound making it relatively cheap”. More at the Hurun 2018 Report. 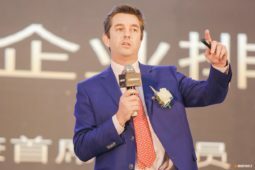 Rupert Hoogewerf is a speaker at the China Speakers Bureau. Do you need him at your meeting or conference? Do get in touch or fill in our speakers’ request form. Are you looking for more stories by Rupert Hoogewerf at the China Speakers Bureau? Do check out this list.